Degradation of rangelands in drylands is occurring at an alarming rate worldwide both in developed and developing countries. Conventional rangeland management assumes overstocking to be the main cause of degradation and thus frequently recommends reducing stock numbers to fixed stocking rates as the primary management intervention. However, practitioners and communal farmers from the drylands of Namibia have found such interventions not only to be socially unacceptable but also ineffective. Changing livestock numbers without changing management has minimal impacts. 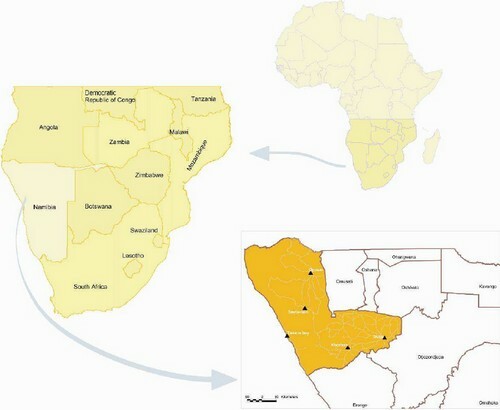 A rural development NGO from Namibia developed a response to rangeland degradation based on experiences of successful commercial and communal farmers within Southern Africa, and, together with key Ministries and the farmers themselves developed a new strategy called “Planned Grazing through Herding” (PGH). This strategy builds on both culturally acceptable forms of management (namely the practice of herding) and on sound ecological and scientific knowledge. In the first three years of implementation PGH has resulted in, amongst other things, reduced livestock losses, increased grass cover, more stable livestock condition and increased milk production. Degradation of rangelands in drylands is occurring at an alarming rate worldwide both in developed and developing countries. In Namibia for example bush encroachment affects approximately 26 million hectares and in places accounts for a decline in carrying capacity from 1 Large Stock Unit (LSU) per 10ha to as little as 1 LSU per 30ha (de Klerk JN, 1999). Briske D.D. et al (2008), in a review of rotational and continuous grazing indicate that little evidence exists that rotational grazing results in improved rangeland and animal performance over continuous grazing. This view is supported by Savory and Butterfield (1999). Namibia is no exception to this and rangeland productivity is declining on Communal Land, Privately Owned land as well as inside Parks (MAWF, 2009). Degradation cannot be said to be merely a result of land tenure or resettlement actions. The review conducted by Briske et al (2008) is specific to the application of commercial grazing operations, and it does not explicitly consider grazing dynamics associated with herding, migratory grazing, or transhumance and fails to investigate initiatives where planned grazing (which adaptively accounts for a variety factors within and between seasons) as opposed to rotational grazing has been applied. Animal impact is only considered in this evaluation in high density rotational grazing systems which fail to respond to fodder availability or recovery periods of grasses. Namibia is in Southern Africa and due to the cold Benguella current on its western shore rainfall is low (<50mm) in the west to above 600mm in the far east (Mendelsohn et al, 2002). The entire country is classified as dryland. The focal area of this intervention is the Kunene Region in north western Namibia on the communal lands. The intervention uses existing conservancy structures as an entry point to manage rangelands. Namibia has a population of approximately two million people with approximately 71% of the population living in rural areas. Most of the population practises subsistence farming of some sort and livestock are an important part of most peoples’ livelihoods. A declining resource base in the communal areas has local, regional and national implications. Residents of the Kunene Region are largely dependent on livestock for their livelihood. The Himba and Herero residents are very closely associated culturally, socially and economically to livestock and cattle in particular. Annual Economic losses attributable to Bush Encroachment alone amounting to N$ 1.6 Billion (MAWF, 2009). In most communal areas today livestock are not herded to new pastures during the rainy season and the growth needs of perennial grasses are generally not considered in management actions. As a result animals wander around water points re-grazing plants before they have recovered (i.e. before they have restored their root reserves) as well as over resting plants further from the water point. The continuation of this practice over time results in overgrazing and provides only partial rest for the veld during the growing season. Unherded livestock form long lines to and from grazing areas and walk repeatedly along the same routes resulting in the formation of paths that later result in gully erosion. During the non-growing season when animals are wandering about they eat the organic matter that has been trampled onto the ground, leaving the soil surface bare for the next growing season. Animals that are not herded have very little impact on the broader landscape resulting in increased capping of soils and as a result poor water and mineral cycles. Interestingly on commercial privately owned farms under fixed rotational and continuous grazing very similar impacts on the environment are realised. 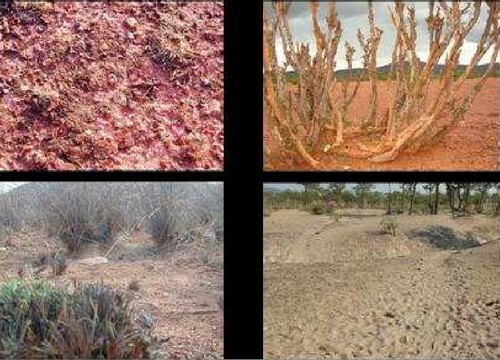 Figure 1: Clockwise from Top left: Current situation in many communal lands: First image is mature capping, second image is over-browsed shrub, third image depicts over-trampling of soil from unherded animals. Bottom left depicts over grazing and over rested grass plants adjacent to one another. Integrated Rural Development in Nature Conservation (IRDNC) a Namibian NGO, has been working in partnership with the Ministry of Environment and Tourism (MET) and rural communities for approximately 20 years to secure wildlife populations on communal land throughout Namibia. Over the last six years IRDNC has expanded this focus to work with the Ministry of Agriculture, Water and Forestry (MAWF) and other key institutions (including the Conservancies, Traditional Authority, Regional Council and other line ministries) on addressing the land degradation in communal rangelands. In the communal land setting in Namibia fencing off of large tracts of communal land requires the Ministers approval. This legislation resulted in IRDNC developing a programme whose main aim was to considering planned grazing through herding as a tool to manage rangeland. This proved to be a high successful approach, as it is cheap, effective and a socially acceptable practise. However the ability of concerned farmers to apply sound rangeland management practises can be hampered by a poor legislative framework to set and enforce principles of sound rangeland management. Thus, one of the objectives of this initiative was to develop acceptable and effective practises at the local level that feeds into and guides the legislative environment. In addition to the poor legislative environment, communal farmers were found to have a poor understanding of the impacts of their current management practises on perennial grasses and what needs to be done to give perennial grass plants what they need to flourish. Very few farmers are attempting to actively manage their rangelands and those that are, are probably not going to bring about significant improvements. The operational environment is further complicated by many decision making entities involved including: individual stock owners, Traditional Authorities, Land Boards and all Line Ministries. Roles between stakeholders were initially not clear and individual rights easily undermine collective action. This was overcome by focussing on the farmer level with the support from the Traditional Authorities and the Line Ministry responsible. Reaching consensus that the problem required action has sustained efforts in many areas to date. Previous rangeland improvement programs and strategies in the communal areas have left little long term impact. These initiatives were socially unacceptable as the focus was on animal numbers and fixed stocking rates often resulting in immediate recommendations for de-stocking. A response such as this too early into an intervention is problematic and not realistic and depending on fodder production in a given season may not even be required. Furthermore, IRDNC considered these approaches to be technically inadequate as changing numbers without changing management has minimal impact. For example, more important than overall numbers is to allow adequate recovery periods and avoid over-rest. In these programmes, the simple tool of animal trampling was not applied. This is where livestock trample grass onto the soil surface, and break surface (1) capping which in turn improves growth conditions. (1) When bare soil is exposed to the elements for an extended time period with no animal impact a hard impenetrable crust forms that reduces the water and mineral cycles and restricts seedling establishment. The project was initiated and implemented by the IRDNC with funding largely from EED (A German Church Development Fund) and WWF (UK) and ICEIDA (Icelandic International Development Agency). implementation. This includes the recognition that a problem exists, the decision that the problem is important enough to require action as well as the execution and monitoring of the plan. rangeland management, which they had been exposed to and bought into. Had strong leadership that was prepared to undertake and support such an initiative. resource base whilst making sound profits in a socially acceptable manner. On farms the hosting farmer lead the visit and talked about what he was doing, why and the results. During these visits, topics covered included management practises, how a grass plant grows, what it needs, and the importance of effective rainfall. Ensuring that grass plants receive adequate time to recover between grazing intervals, by herding the livestock to a different area for grazing each day. This principle provides the right conditions for perennial grasses. Effective animal impact is being applied through the herding of livestock to and from grazing areas each day. This principle ensures that organic matter is laid onto and into the soil surface improving the mineral and water cycle. Adjust animal numbers (upwards or downwards) in May to ensure that there is enough fodder to meet the entire herds’ needs until rain can be assured. Figure 3: Exchange visits are an excellent way of learning. Here stakeholders from Caprivi visit Erora Grazing Area in Kunene. IRDNC facilitators from the region worked together with all livestock owners from a given water point, the Traditional Authority from the area and MAWF to develop a collective plan or strategy. traditional norms related to livestock handling, such as not watering livestock at night, not combining herds, and not kraaling together. In all cases the identification of grazing committees made up of all livestock owners identify grazing areas within a conservancy boundary. The grazing committee becomes the decision making body that agrees to combine livestock, herd their animals daily and develop the Land and Grazing Plan. The grazing committee expands if new farmers are allowed to settle temporarily. IRDNC supports, groups of farmers at a given water point who agree to combine their livestock into one herd. Based on the above principles farmers developed a response and worked through many social and production barriers. No formal committees have been formed to date but in most cases the permanent residents have set rules of use of the water point and if farmers apply to settle here one condition is that livestock will move in a single herd according to the grazing plan. Herders and supervisors of the herders have been appointed. Supervisors establish the grazing plan with herders and farmers in a flexible manner. The main aim of this strategy is to get the herd to the right place at the right time for the right reasons. This primarily involves the herding of all livestock from a single or several water points to a different patch to graze each day to account for the plant and grass needs. The herd of up to 1000 animals should only be in a given area once during the growing season and once during the non-growing season. trampling etc). Because no fences are involved this plan is very flexible and simple. At the end of the growing season (May), agreement is reached whether there is sufficient production to enable the number of animals currently at the water point to be carried until the rains are most likely to have arrived. A drought reserve should also be built in. The sooner livestock are either moved or sold, the fewer need to be removed or sold and better prices are assured. herders remain with the herd the whole day and return to the kraal at sunset. The number of herders and rotation of herders depends on circumstances. For training, extension, fund raising and advocacy purposes, IRDNC produced a DVD outlining planned grazing and herding as well as some basic low stress livestock techniques. Low stress handling techniques are very important as increased stress reduces animal performance and often reduced market process if meat is bruised. This DVD is being used by some implementers and trainers in four African countries (Namibia, South Africa, Lesotho, Zimbabwe and Kenya) and it has been adopted by several international entities. It has been translated into several local languages. The DVD has no technocrats speaking – it consists of decision makers and farmers talking about planned grazing and herding. It is used during all exchange trips to re-enforce learning from what has been seen. Ten areas are now conducting planned grazing with five grazing areas having practised planned grazing and herding for three years now. In these cases, IRDNC role is now mainly to provide regular follow up support and assistance with keeping water infrastructure operational in very remote areas. In six years of implementation all training has been done through exposure trips and on site ‘ecological literacy training’. 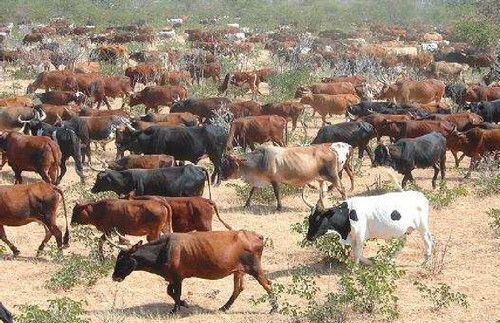 Reduced livestock losses: Because livestock have herders with them all day and are kraaled at night, losses due to livestock theft, predators and animals wandering off have been reduced. Annual grasses replacing bare soil: trampling of soil through herding breaks soil capping and flattens some organic matter onto and into the soil surface thereby improving the water and mineral cycles which in turn results in more effective rainfall, higher production and more conducive germination conditions. Annual grass production has already replaced bare ground at a large scale at all sites. Over time it is expected that perennial grasses will also recover. Improved animal condition. Although animal condition of unherded animals appears to be superior during the growing season, this soon changes when fodder becomes limited and unherded animal condition drops considerably. Increased milk production. Farmers note increased milk production per day and extended periods of milk production after cows in adjacent unherded areas are no longer producing milk. Land use synergies: Planned grazing decreases conflicts with tourism and provides a valuable tourism experience. Because all livestock are in one herd, tourists have the opportunity to, for example, seeing milking done in the morning or accompany the herd into the veld with people who can increase environmental literacy. In many areas livestock and cropping are competing activities (crop residues are grazed reducing soil organic matter over time). Herded animals can be kraaled on crop fields for short periods to improve soil fertility. Reduced costs: Herding can result in all internal fences being taken down – improving the tourism experience and reducing maintence costs of fences. Improving habitat for game species: In parks, livestock managed using PGH can even improve habitat for high value game species by changing the morphology of perennial grasses to more palatable growth forms. Furthermore, large herds have the ability to flatten course grass onto the ground – making new growth available for selective feeders. Sound local level land use planning: Planned grazing and identification of grazing areas allows sound local level land use planning for cropping and grazing areas, thereby securing grazing areas where cropping is an important livelihood activity. Multiple land use areas: The identification of grazing areas enables wildlife corridors, grazing/multiple use areas as buffers around parks to be developed. Figure 4: Herded livestock at Erora, Kunene Region. This herd has been herded daily for three years. Herd size has varied from 700 to 1200 animals. This approach is changing communal farmers from livestock managers to livestock and rangeland managers. The development of this approach in partnership with the MAWF has enabled the adoption of this approach in various National level approaches. The principles of sound rangeland management are being applied in the communal areas of Kunene and Caprivi Regions. 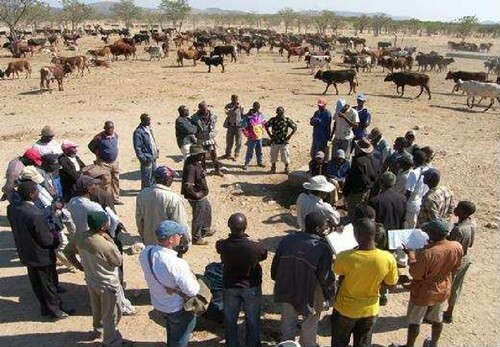 The principles of sound rangeland management included in a Draft National Rangeland Policy and Strategy developed by the MAWF and the Meat Producers Association of Namibia are in line with the practise adopted here. This is an example of sound practise from the communal sector filtering up to National level Policy. The Holistic Resource Management (HRM) approach using Planned Grazing through Herding is economically favourable to fencing, more effective and has local and national benefits. It is socially acceptable and addresses the root cause of degradation in the communal setting. The approach has real potential for adoption on privately owned land as well as resettlement areas. To date IRDNC has not encountered resistance in the communal areas to this concept and continues to receive requests by farmers and conservancies to facilitate this approach in their areas. The project has since expanded to areas with 10 more communities requesting support. Herding is a very tough job, which is characteristically low paid and frowned upon. One of he initial mistakes made was to use the term “herder”. IRDNC, together with the farmers, is investigating terms such as “rangeland” and “livestock managers”, so that their true status nd importance of their job is reflected. Changing the perception of herding from a lowly job, o a position of importance and status is key to the success of these ventures. The development of improved rangeland management approaches must take into account that most rangeland practise in the dryer areas of the world have are resulting in continued degradation. In the improved rangeland management field, practise by dedicated farmers leads the field in terms of reversing rangeland degradation in a financially viable and ecologically sustainable manner. The facilitation process required to adopt socially acceptable and technically sound approaches of improved rangeland management in communal areas is best done through the exposure of key communal stakeholders to carefully selected successful farmers. In six years no formal workshops have been conducted – on farm facilitation has proved to be an effective mechanism to increase understanding of ecological processes and the impact of animals on these processes. The first step in changing management is accepting responsibility for the degradation caused to date. The second step is the realisation that solutions are available and doable. Grazing committees were established in a flexible manner to allow for the coming and going of farmers from grazing areas – provided all newcomers to the area agreed to abide by the rules of sound management for as given area. Building on cultural herding techniques is the single most important lesson in bringing about change. This enables changes to management to be socially and culturally acceptable enhancing its chance of adoption. The production of a DVD outlining the HRM approach and low stress livestock handling, including only farmers’ lessons and learning has proved to be the most successful extension tool developed by IRDNC to date. The status of herders needed changing to account for the important role they are required to play in the conservancy. 10 PGH has been expanded to 10 sites in 6 Conservancies in Kunene Region. It is expanding to Caprivi, Kavango and Otjozondjupa Regions where farmers Traditional Authorities and MAWF staff are interested in this new approach. All farmers who now show interest in this approach are taken on an exposure visit by IRDNC together with the MAWF staff to talk to farmers who are applying planned grazing and herding. After these exchange visits a plan of action if any is developed with the farmers. Plans and support are taken forward from here. The expansion of this approach within Namibia must become the next focus. The support of the Minister and Deputy Minister and many other MAWF staff to date has been obtained and their support of this approach given through the DVD is a good starting point. The principles and approach developed during this initiative have been adopted by several national level initiatives. The facilitation of this process and the entrenchment within government structures including the development of incentives to apply these principles is the next critical step. This approach developed for the communal area setting is showing results and acceptability but it has far wider applicability. The private farms and parks need to consider how they might begin to include the principles outlined above. 1) Briske, D. D., Derner, J. D. , Brown, J. R., Fuhlendorf, S. D., Teague, W. R., Havstad, K. M., Gillen, R. L., Ash, A. J. and Williams W. D. (2008), Rotational Grazing on Rangelands. Reconciliation of perception and experimental evidence. Rangeland Ecological Management 61: 3–17, January 2008. 2) De Klerk (1999). Bush Encroachment in Namibia. Report on Phase 1 of the Bush Encroachment Research, Monitoring and Management project. Ministry of Environment and Tourism, Directorate of Environmental Affairs. John Meinhert Printing. 3) Ministry of Agriculture, Water and Forestry, 2009. Managing Namibia’s Rangelands. National Rangeland Management Policy and Strategy (NRMPS). Draft 2. January 2009. 4) Mendelsohn J., Jarvis, A., Roberts, C., and Robertsohn T. 2002. Atlas of Namibia. A Portrait of its land and its people. New Africa Books PTY LTD. ISBN 0-86486-516-3. 5) Savory, A. and Butterfield, J. 1999. Holistic Management: A New Framework for Decision Making. Island Press, Second Edition. ISBN 1-55963-488-X.